Commander Welch was hired as the director of the Challenger Learning Center in June 2013. He attended Geneseo State University where he graduated with a BA degree in Mathematics before earning a master’s degree in Education at St. Bonaventure University. He began his teaching career as a mathematics instructor at Cuba Central School before accepting a position at Olean Junior High/Olean Middle School where he taught computer literacy/programming and technology for 25 years. He also started the engineering curriculum known as Project Lead the Way (PLTW) at Olean High School. Commander MacQueen has BS and M.Sc. degrees from Edinboro Univ. of PA with concentration in Ecology. He retired from a 40-year teaching career in Warren County, PA and 11 years at the Learning Enrichment Center. In addition to teaching in public schools, he has been involved in educational programs for the National Forest Service, National Park Service and National Ski Patrol. Commander Keough graduated from S.U.C. Geneseo with a BS in Education. He later became certified in K-12 Vocal Music and taught in that capacity at Scio (NY) Central School for 24 years before teaching 4th grade for seven years. He now supervises student teachers at St. Bonaventure University. Jim was also an applicant to the Teacher in Space Project back in 1985, so the Challenger mission is close to his heart. In his spare time, he enjoys flying radio controlled model aircrafts. Commander Bushnell attended Ithaca College as a music major but discovered he enjoyed the field of communications more. He spent 30 years as chief engineer at WHDL-AM/FM in Olean, NY, but he is best known as the friendly, morning, on-air personality at the station. Commander Bushnell received recognition for his many years of community service by being awarded the 2010 Good News Award for Outstanding Enhancement of the local cultural environment. He continues to share his love of music by serving as Musical Director of the Olean Theater Workshop. Commander Bushnell attended St. Bonaventure University and received her BS in Elementary Education in 1971 and master's degree in Reading in 1980. During her 35-year teaching career, she taught grades 2, 4 and 5-8, including special education and remedial math. For eight years she was also a master teacher for the Neighborhood School of Dance at the Salamanca, NY studio. Commander Bushnell was the Technology Using Teacher of the Year in 2007 and received the Lorrinda Murray Innovative Teacher Award in 2010. Commander Jackson was one of the first students to graduate from Jamestown (NY) Community College with an Associate of Science degree in Professional Piloting. After a short time as a flight instructor at Jamestown Aviation, he founded Alle-Catt Flight School at the Bradford Regional Airport before becoming one of the founding members, the chief club instructor and the Board of Directors Treasurer of Twin Tier Aviation, a local flight club. Twin Tier is the only flight club in the local area serving both the Olean and Bradford markets with flight instruction. Commander Norton attended D'Youville College and received her BS in Psychology with teaching certification in Special Education and Elementary Education in 1980 and her master's degree in Special Education in 1984 from SUC at Geneseo. During her teaching career, she taught Special Education classes for the Franklin, Essex and Hamilton County BOCES, Corning-Painted Post School District, Muscatatuck Special Education Center in Madison, IN, Olean City School District and substituted for Buffalo Public Schools. She also was a Peace Corps Volunteer and served as a Special Education Teacher Trainer in Trujillo, Colon, Honduras, Central America from September 1988 to December 1990. Commander Soplop graduated from St. Bonaventure University in 1974 with a bachelor’s degree in mathematics along with teaching certification for grades 7-12. She continued her education at Syracuse University and received a master’s degree in library science in 1976. She worked in public and university libraries but spent the majority of her career as a school librarian in the Olean City School District from which she retired in 2014. 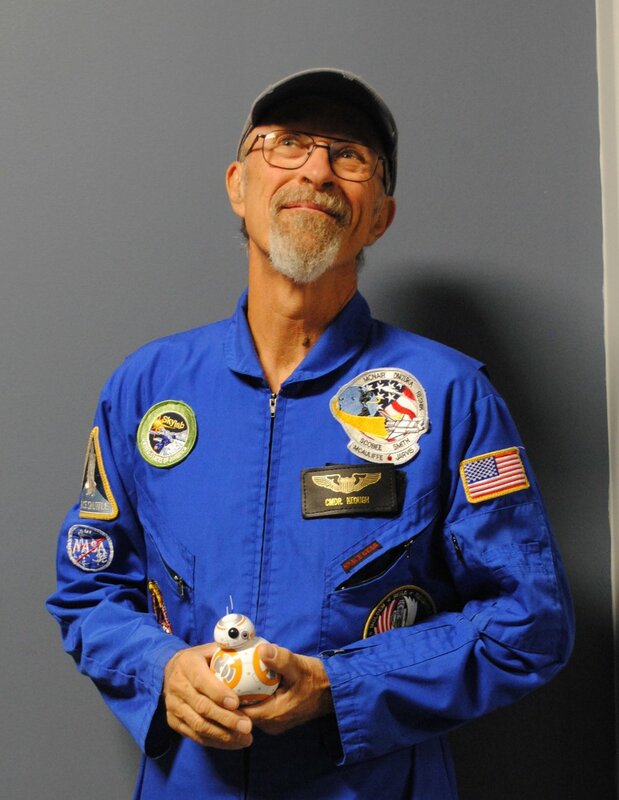 Commander Soplop actually worked as a summer intern for NASA in Washington, DC way back in 1975, one year before the agency unveiled the world’s first reusable manned spacecraft, known asthe space shuttle! Commander Bauer graduated from Fairmont College in 1974 with a bachelor's degree in Elementary Education. In 1984, he received a Master's degree in education administration from Penn State. He taught grades 6-8 at St. John's Catholic School in Olean before accepting a 6th grade position in the Olean City School District. He retired from public school teaching in June of 2015. For over 20 years, he has spent his summers as the Aquatics Director for the Boy's and Girl's Club at Chautauqua Institute and continues in this position. He is an avid sportsman, interested in hunting and fishing as well as a lifelong swimmer. He loves spending time with his twin granddaughters, Harper and Hailey, along with his fishing buddy (grandson), Carter. Commander Kane attended St. Bonaventure University receiving her BS degree in Elementary Education in 1977 and a Masters Degree in Counseling in 1984. She taught Science and English Language Arts to 5th and 6th graders at Hinsdale Central School for 39 years before retiring in June of 2016. Commander Kane has a passion for travel and photography taking any opportunity to explore new places and meet new people. She loves the outdoors and enjoys kayaking, snowshoeing and stargazing. She spends as much time as she can with her grandchildren; Landon, Dash and the newest arrivals, Knox and Isla, spoiling them as much as she can. Commander Kane is thrilled to join the crew at the Challenger Learning Center.